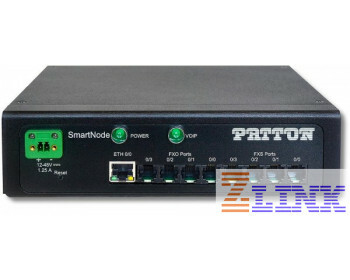 The Patton 4140E Industrial VoIP Gateway is ideal for delivering VoIP telephony in outdoor or environmentally exposed environments where heating and cooling cannot be controlled. The unit can be DIN-rail or ceiling mounted. Patton's Industrial VoIP Gateway facilitates IP-based voice delivery and is ideal for industrial automation, military communications, railwaysm public transportation, public and private outdoor phones (emergency phones in parking lots, along roadways, and railways and within underground tunnels). The SN4140E provides interconnection and conversion between modern IP-based Voice networks using SIP and tranditional analog phones, analog PBX equipment or PSTN lines. The Patton SN4140E is designed to withstand shock (IEC 60068-2-27), vibration (IEC 60068-2-6), extreme temperatures (-40 to +70 °C), up to 85% humidity (conformal coating option protects up to 100%), condensation, and frost.